For some young adults, military jobs present the best way to get career training. Deciding to join the armed services, however, is a decision that will greatly impact your life. While there are reasons for enlisting, there are as many reasons for not doing so. Choosing the wrong civilian career means that you've wasted your time and money and may have to spend more of both to get your career on the right track, but in the end, you can always quit your job. If you've enlisted in the military, and then realize you've made the wrong choice, there is little you can do about it for the length of your term of service. Make sure you are aware of everything the armed forces expect of you when you enlist, including the fact that you may have to be involved in combat. While many people are enthusiastic about this aspect of being a member of the military, others are less so. Before you sign up, read more than the brochures a recruiter hands to you and the website he shows you. The goal of that literature is to make serving in the armed forces as enticing as possible. "What the Recruiter Never Told You" by former U.S. Military Guide, Rod Powers, discusses in an honest, straightforward manner, why the military may or may not be for you. The five branches of the U.S. military—Army, Navy, Air Force, Marines, and Coast Guard—all offer training that can influence your future career opportunities. It can lead to a military job, which is referred to as a Military Occupational Specialty or MOS. The Armed Services Vocational Aptitude Battery (ASVAB), which all enlistees must take, helps determine what career path is most suitable. Let's take a look at the military jobs in each branch of the United States Armed Forces. 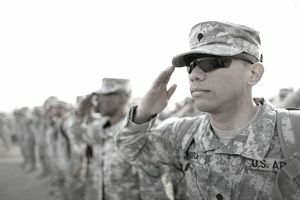 U.S. Army enlistees may follow any of a multitude of career paths including ones in intelligence, arts and media, computers and technology, and the medical field. You can explore Army jobs, the qualifications one needs to pursue them, and how they translate into jobs in the civilian workforce on the U.S. Army web site. That is where you will also find the Army career explorer, a tool that can help you match your interests with Army jobs. Those who are currently serving can utilize the Army's Credentialing Opportunities On-Line (COOL). It is a Web-based resource that helps soldiers learn what civilian credentials relate to their MOS career fields. There are many career options available to men and women who enlist in the Navy. For example, you can train for a variety of careers in arts and photography, news and media, aviation, engineering, healthcare, human resources, and meteorology, as well as other fields. Explore and compare your options on the Navy website. Regardless of what career you want to pursue, you can probably find training for it in the U.S. Air Force. You can train to work in aerospace maintenance, air transportation, audiology, psychology, social work, dentistry and a variety of other fields. Search by keyword or select occupational fields on the U.S. Air Force Website. Enlistees in the U.S. Marine Corps can also train for many different careers. Choices include aircraft maintenance, legal services, corrections, communications, air traffic control, finance, and food services. Use the Career Tool to help you identify suitable roles, or careers, by answering a series of questions about your interests. Then view videos to learn about them. You can also look at a list of all roles in the Marine Corps. The Coast Guard and the Coast Guard Reserve trains enlistees in a variety of career fields. They include safety and law enforcement, maritime patrols, technology, and environmental operations. Visit the U.S. Coast Guard Website to learn about the various career opportunities. Each job description includes information about related civilian jobs.